Page Street Publishing, 9781624145568, 192pp. From a classic dogwood rose, to a sly fox, to feathers that take on a dreamy quality, you can create polished artwork in just a few easy steps—no sketching required. 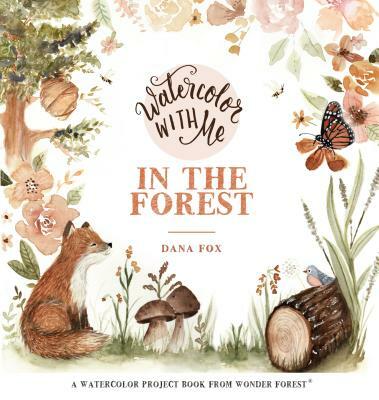 Dana Fox, creator of Wonder Forest, is known for her unique and whimsical sense of style, and her popular watercolor workshops have introduced thousands to the joys of painting. In Watercolor With Me in the Forest, Dana provides light outlines of each project, and every page is printed on premium art paper, so you can focus on the watercolor techniques—wet-on-dry, wet-on-wet, painting fur and ink and wash. Even if you’ve never picked up a paintbrush before, Dana’s creative tricks will ensure that every piece of art is frame-worthy. Whether you’re looking to try a new style, learn the basics or find a new way to de-stress, this step-by- step guide makes it easier than ever to create stunning art. Dana Fox is the creator of Wonder Forest, and her work has been on the shelves of Target, Urban Outfitters, Wayfair, Bloomingdale’s and many others. She lives in Ontario, Canada.